If you're interested in an entertaining, tongue and cheek (the way I viewed it anyway) recollection of factoids about the British, you can't go wrong with The Evil Empire: 101 Ways That England Ruined the World. 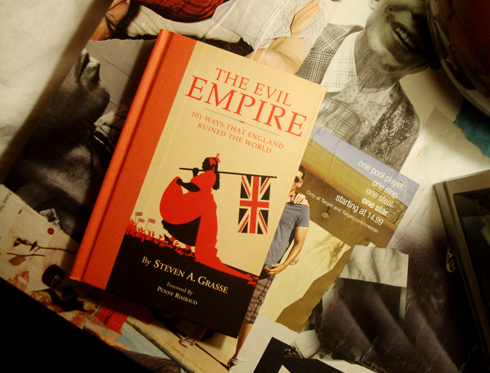 Written by Steven A. Grasse, he explains that the idea for the book came about from being criticized by Brits who had strong opinions about the USA. I can't say I blame them, but Grasse makes some good points from the perspective of a citizen of the current world superpower towards the actions of the former. The book is a great light read as the list of 101 points is divided up into comfortable one or two page summaries of specific criticisms. From things like 'they hooked the Chinese on Opium' to 'they caused the Great Depression', The Evil Empire is a fascinating read that just goes to show for as critical as we (as in the rest of the World) are of the USA, they're not just paying for their mistakes, but are currently paying the price for a long chain of events that we've all played a part in creating. However, in true managerial fashion, if you're at the top, you're also the easiest one to blame. I can see both Americans and Brits getting up in arms about who did what, who's worse, etc. But frankly, I'm Canadian so historically we've had our issues with both, haha. If you're easily offended I can see this book striking a nerve, and to be honest, I can't tell if Grasse is taking himself too seriously or not - but I'll give him the benefit of the doubt. The Evil Empire is a mixed bag of cultural and historical snippets that create a convenient argument, but essentially just asserts that there's no shortage of guilt to pass around. Of course, it's easy to make a case for how much the British have also improved the way our modern world operates - English is a great language after all. But naturally this is more fun.